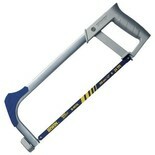 A 12" long, lightweight hacksaw which comes fitted with a 24tpi bi-metal blade. 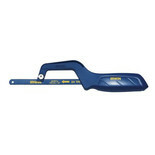 Top quality 'pro' use junior hacksaw for all sorts of general metal & metal alloy cutting. 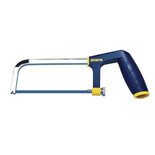 Compact size means it's particularly useful for smaller jobs, or where space is tight and access awkward. 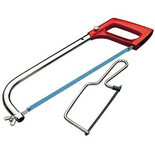 An incredibly useful, and durable, 'mini' hacksaw / jabsaw that's ideal for use confined spaces and awkward to access corners. 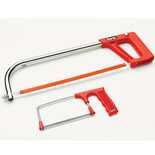 This 2 piece set consists of a 12” (300mm) engineer’s hacksaw and 6” (150mm) junior hacksaw both with lightweight aluminium frames. 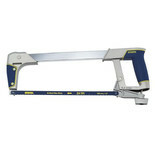 A rigid steel framed hacksaw with reinforced glass fibre moulding and a comfortable, soft grip handle that improves both the power delivery and precision of each and every cut.